The son of a Chevrolet division chief, Greg Hildebrandt and his identical twin brother Tim were born in Detroit, Michigan in 1939. After attending the Meinzinger Art School, Greg and Tim helped produce animated training films for the auto industry, the military and major US corporations. In 1963, Bishop Fulton J. Sheen brought them to New York to work on art for his weekly TV show and to produce films on world hunger. They traveled to South America and Africa and created several documentaries. In 1969, Greg and Tim started the next phase of their careers as commercial illustrators. They created art for children’s books, educational books, advertising art, editorial art, film strips, book and magazine cover art and storyboards until 1975. Greg’s big break came when Ballantine Books hired them to illustrate the 1976 J.R.R. Tolkien, Lord of the Rings calendar. This art launched them into international fame. Then in 1977 they created the first Star Wars movie poster. The name The Brothers Hildebrandt® was born. Their art has been shown around the world. It is collected internationally. They won numerous awards and honors including the Gold medal from the Society of Illustrators. In 1999, Greg decided to create a series of retro pinup paintings, which he calls his American Beauties. Aged 60, it was time to paint just for himself. This was a series he had dreamed of doing since he was eight years old and he saw his first Gil Elvgren pinup calendar in his Grandfather’s basement. However Greg didn’t want to copy the great pinup artists of the 1940s and 50s -- he wanted to create his own vision. And he did. Within weeks of finishing his first painting in this series he landed a one-man show at the Meisel Gallery in Soho, New York. For the next year, Greg painted beautiful women in retro clothes and settings. He created and painted images filled with the objects he loved for his first show, including boats, a plane ...and a Duesenberg. Since then, Greg has gone to many car shows to hunt for the perfect car for his next pinup. He has photographed dozens of cars and created hundreds of sketches. But only a few of them end up in a final painting. As he says, “There is so little time and so much to paint.” And of course, let’s not forget the girls! Greg isn’t happy unless he can find the right girl for each painting. The girl has to fit the scene -- and the scene has to fit the girl. 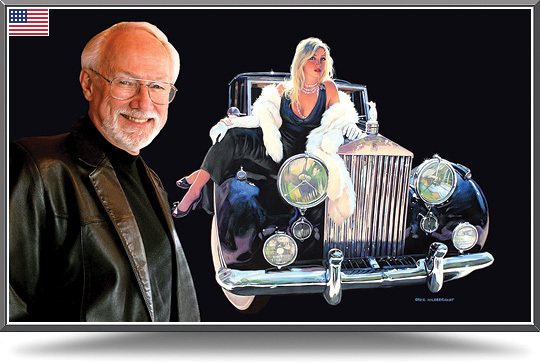 Greg was extremely honored in 2006 when asked to paint the poster for the Glenmoor Gathering Concours d’Elegance. Ralph Marano’s 1939 Packard was chosen for the poster. Greg chose Miss Jennifer Cella, lead singer for the Trans-Siberian Orchestra as the model. On a cold April day in New Jersey, Jennifer gently leaned against the Packard, Greg shot his photographs, and together, the car and girl are magic! In 2011, Greg was approved by the estate of Marilyn Monroe to be an official Monroe artist for the Bradford Exchange. His Marilyn Monroe Dream Date artwork appears on Bradford collectibles. Greg’s American Beauties Collection has unique subsets. There are good girls and bad girls, and each painting has a story to tell. His paintings with automobiles are a very specific subset. One that Greg will be adding to on a regular basis. Greg has always said that art has the ability to transform and inspire. It is his hope that his art stirs passions within the viewer, and that it fulfills your fantasies and dreams. Of course he is talking about the cars! Commission Greg to create a unique painting for you!